The finest quality and most authentic Culinary Flavor Systems come from Custom Culinary, Inc. We bring authenticity and simplicity together for you. Offer cooked-from-scratch flavor in an add-water-only concentrate format. Created to hold on a steam table for up to 8 hours while providing consistent flavor and texture. 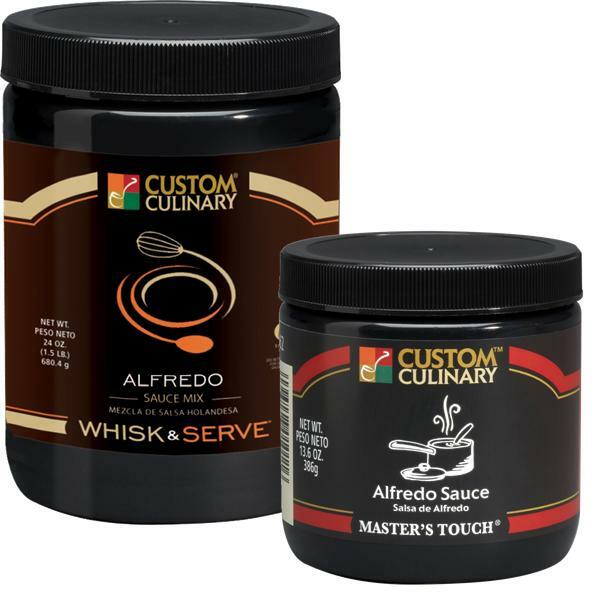 Available flavors are Alfredo, hollandaise, and demi-glace. Offers best-in-class flavor and simple water-add only preparation. No need to add additional ingredients such as milk or butter. Can be frozen and reheated without separation or spoilage. Flavors include demi-glace, Alfredo, hollandaise and beurre blanc. Just whisk and serve. With Custom Culinary® Sauces, it is that simple.